As a mom to two boys, I don’t often get to make something girly. 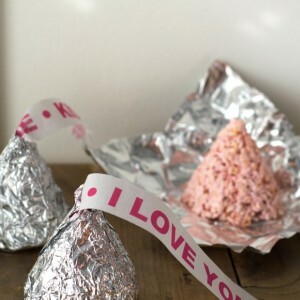 I saw this idea for marshmallow nail polish bottles and knew it would make an adorable Valentine’s Day treat! I created a cute FREE printable for you in case you want to make this treat for the girls in your life. 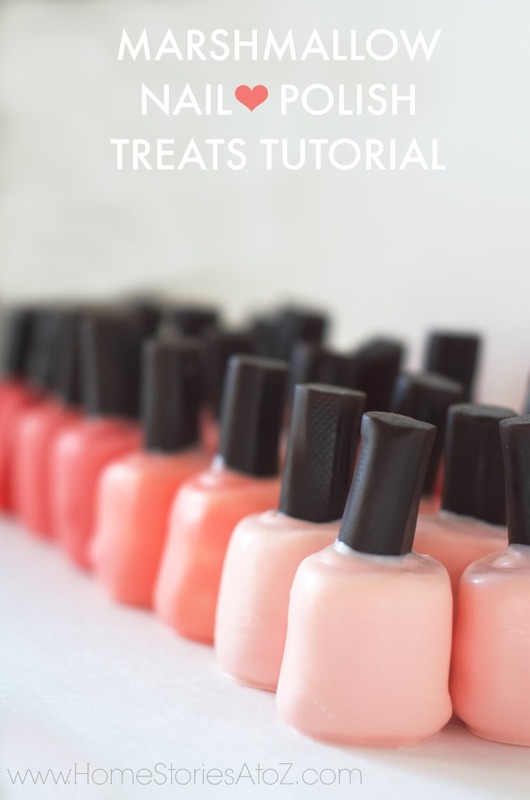 The best part is that if you’re not feeling up to making treats, you can still use the printable with real nail polish bottles. 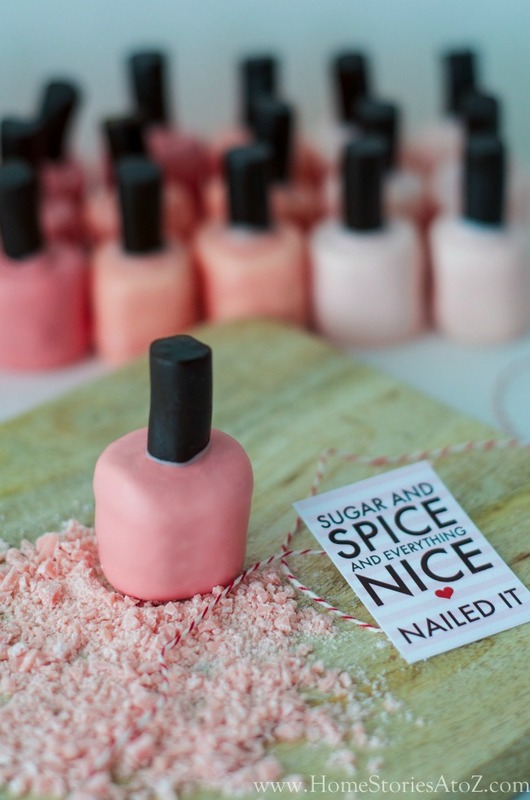 Read on to find out how to create Marshmallow Nail Polish with adorable Sugar and Spice printable! 1. Prepare your work surface with a sheet of parchment paper. Fill a mug about half-way with chocolate wafers. Melt the chocolate wafers in the microwave according to package directions with about 1 teaspoon of shortening. (The shortening thins the mixture, adds sheen, and prevents the chocolate from hardening too quickly.) You can mix different colored chips together to create various shades of color. 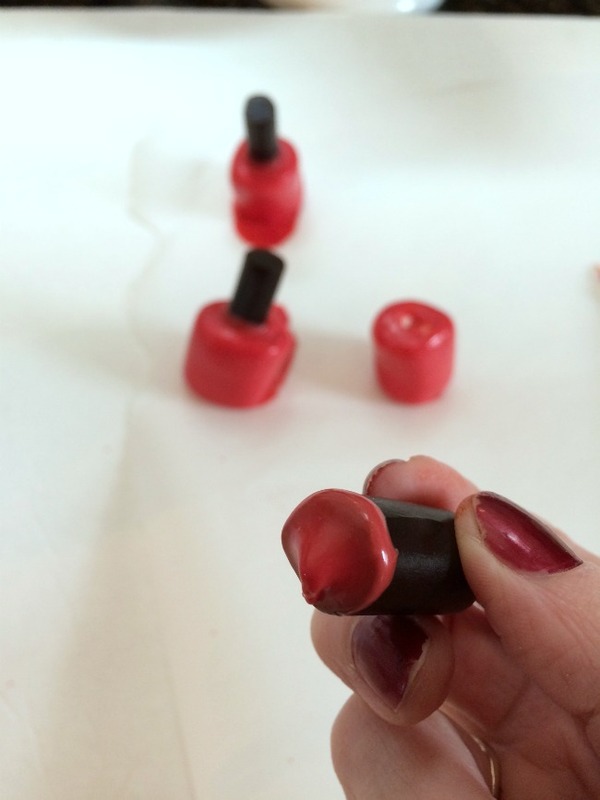 I used red, pink, and white chocolate wafers to create various shades of “nailpolish”. 2. Place the marshmallow on a wooden skewer and dip into the chocolate. Swirl around until the marshmallow is completely covered in chocolate. 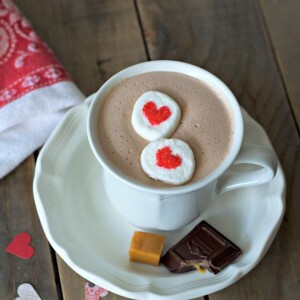 Rapidly tap the excess chocolate off while turning the marshmallow. Pretend you are “roasting” the marshmallow and just keep turning and tapping until all the drips are smooth. Don’t rush this step. 3. Use another clean skewer to help gently remove the marshmallow onto the parchment paper. Tip: Dip your wooden skewers in shortening to ensure that the marshmallow comes off the skewer easily. Clean off the skewers with paper towel after each use. Wait until your chocolate is completely set before touching. If your chocolate has puddled, cut off any excess with a sharp knife. 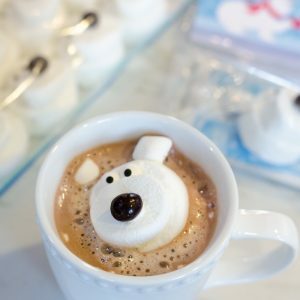 Marshmallows are not all perfectly shaped and some of your marshmallows might be downright lopsided! I recommend buying two bags of marshmallows so that you can pick through for the best shaped ones. I didn’t do this and wished that I had. So cute! But now they need a Valentine card to make them Valentiney. I created this adorable Sugar and Spice and Everything Nice, Nailed It! 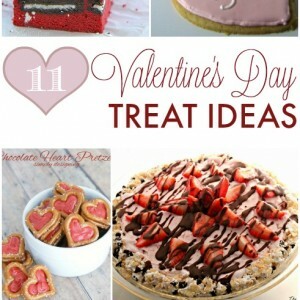 printable to accompany your sweet treats. 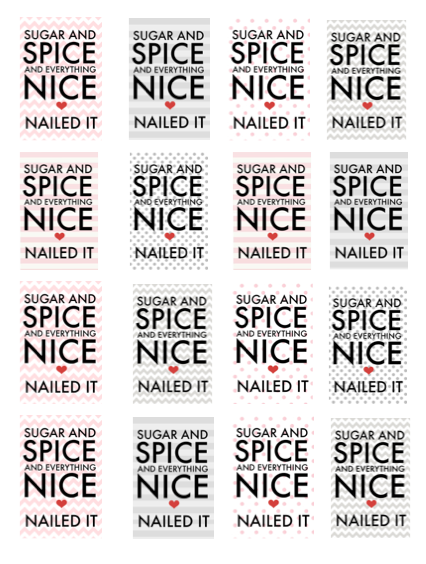 You can click here to download a copy, Sugar and Spice Printable. If your treats will not be served immediately, you will need to package them in treat bags. 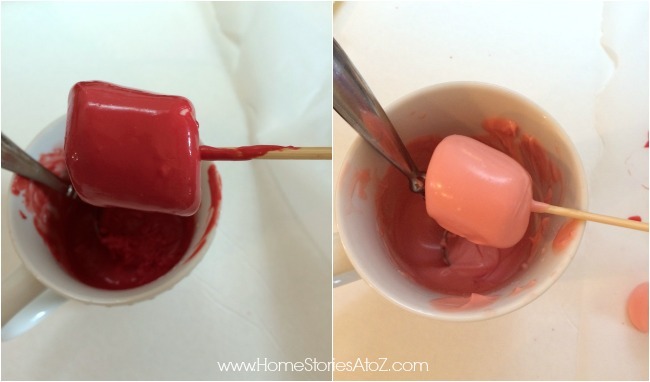 I used Wilton cake pop treat bags and they worked perfectly! You can make these treats ahead of time. Simply store your marshmallow treats in an airtight container and they will keep for a few weeks. I love how they turned out and hope you do too! 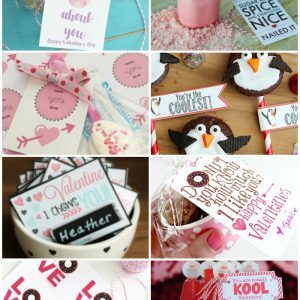 If you are looking for some other cute Valentine’s Day ideas, you will enjoy my Valentine’s Page. You might also like related posts below. Hi Kylie! I’m referring to chocolate melting wafers instead of chocolate chips. You can find chocolate melting wafers (the round, coin-shaped melting chocolates intended for candy making) at craft stores like Michaels and at Target or grocery stores. You can use white chocolate and food coloring but for best results I’d avoid melting chocolate chips. We made these for my daughter’s spa birthday party. Absolutely adorable and a huge hit! And I love the fact that they were do-able!!!! So many times in blog-land and Pinterest worlds, the ideas are cute but unrealistic or super complicated. These worked and I would definitely make them again! Oh I’m so glad they worked for you! Hi! I just found your website, and so many things look great! 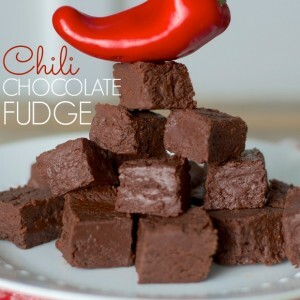 I would love to make these for my daughter, but she has a severe soy allergy. What could be used in place of the vegetable shortening to achieve the desired results? Thanks! Thanks! I’ve only made these once according to this recipe and haven’t tried any substitutions so I can’t really say what might work. We just made these for my second grader to take to school tomorrow- they turned out just great!! We used tootsie rolls for the top. She did pretty much all of the work herself- which made me happy, too! They really took no time at all, and turned out really POLISHED! Lol! Wonderful! I hope the kids adore them. Thanks for letting me know! 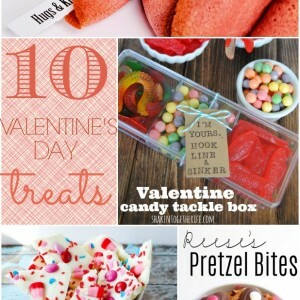 These are such a cute Valentine for girls! 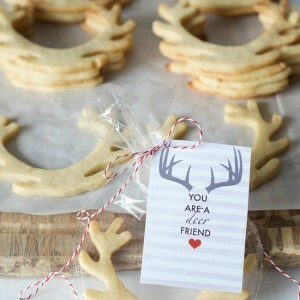 I would love to make them for all the girls in my sons class (I know I will eat several). 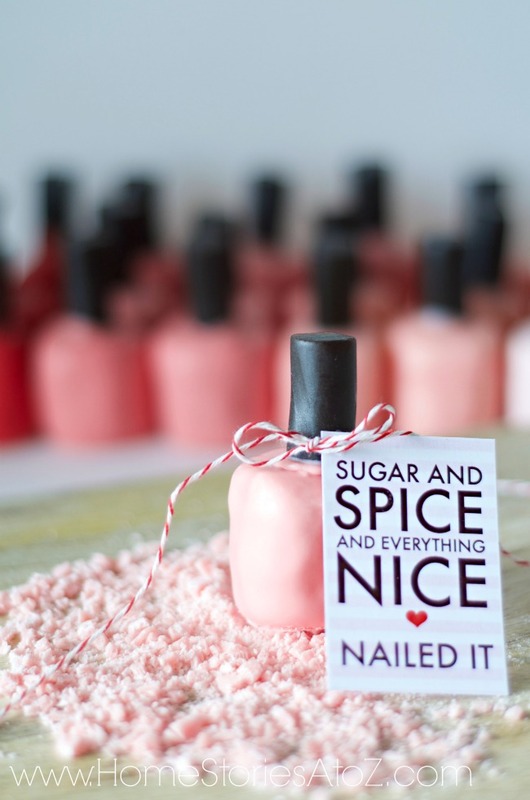 They would make an awesome treat for a spa themed baby shower or bridal shower too. OMG I just shared this on FB. I love this idea! I just decided to have my daughter’s birthday party at the nail salon and these will make great snacks there! I just love them! Oh, that will be so cute!! These are aDORable! 🙂 Love the Hershey’s kiss rice crispie treats, too. And love that they are gluten-free, since that matters for us. Thanks! Wow, it is so realistic, I would be terrified to eat i ;-). Love this printable! 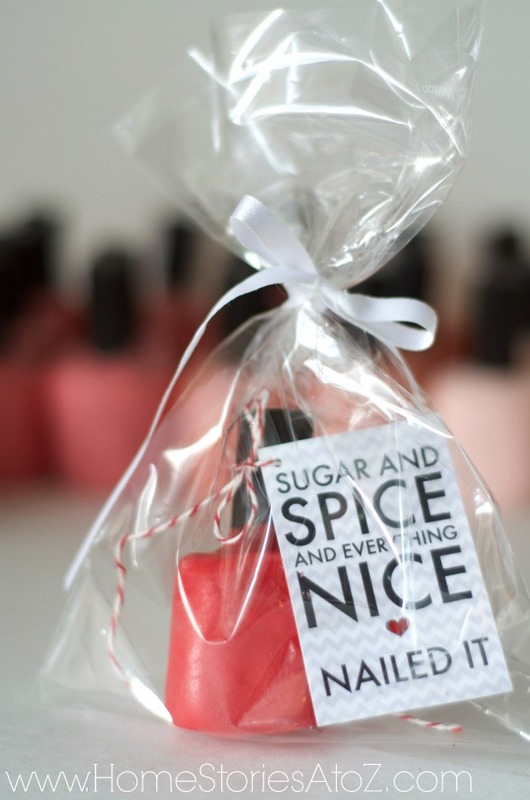 The nail polish bottle is so clever too, pinning!